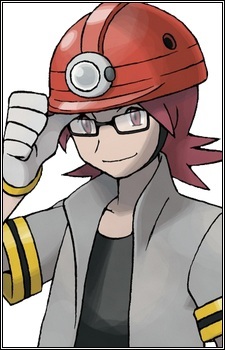 Roark (Hyouta in original Japanese language versions) is Byron's son and specializes in Rock-types. He is also the supervisor of the Oreburgh Mine. His Pokémon in the game and anime are Geodude (Lv. 12), Onix (Lv. 12), and Cranidos (Lv. 14), but in the anime, his Cranidos evolves into a Rampardos. When defeated, he awards the Coal Badge to the victor. Before being fought, he must be found in Oreburgh Mine. Roark also greets the player when they first go into the Underground area.